There was absolutely no hitching done today and it’s all Damien Dempsey’s fault! Well, sort of. 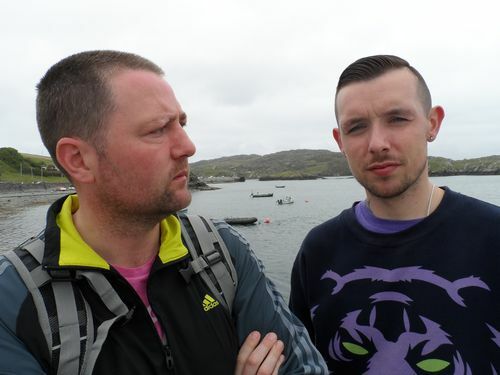 I wrote in my previous blog about how I had been trying to track down the inspirational musician for an interview ever since I heard he was on Inishbofin. Alas it didn’t materialise and I was fine with that, no attachment, happy to go with the flow, although a little embarrassed that maybe I was getting into stalker territory by emailing and tweeting him and texting his mate. Last night after a great communal dinner in the hostel I started writing my blog and getting photos and audio files ready for publication. I had to wait til midnight for the place to quiet down and it ended up being 3am before I jumped into my windswept tent, getting just 3.5 hours sleep and waking at 6.30am to get ready for the ferry. 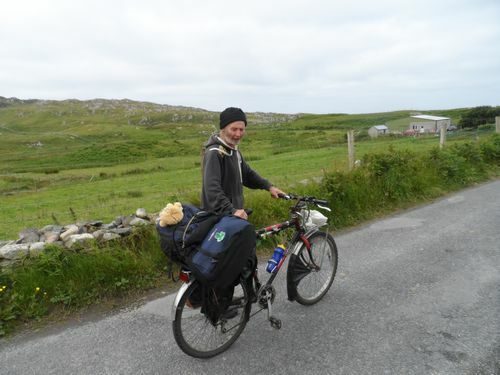 I folded up the tent, packed my packs and Brendan once again served up a great feed of porridge and coffee before kindly helping me with my overweight bag to the ferry. Off I went, both sad and happy of heart to be leaving this special little island with such warm people, locals and visitors alike. 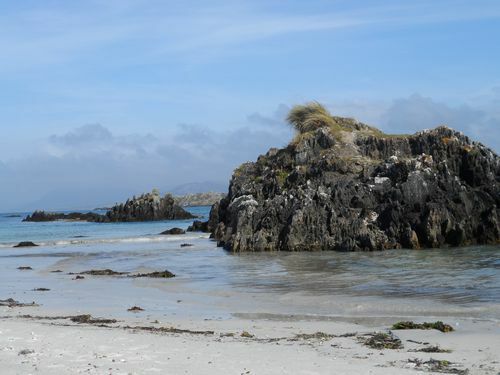 And we’re off – back to ‘the mainland’, and where’s Damo? And who did I meet within seconds of getting on the boat? Nope, not Damo but Adrian from the Beach Inn, who I had interviewed yesterday. We got to talking, with me mentioning my Damien Dempsey quest to which he replied that Damo was still around and he would be happy to help sort out the interview if I cared to come back with him on the next ferry just a couple of hours later. 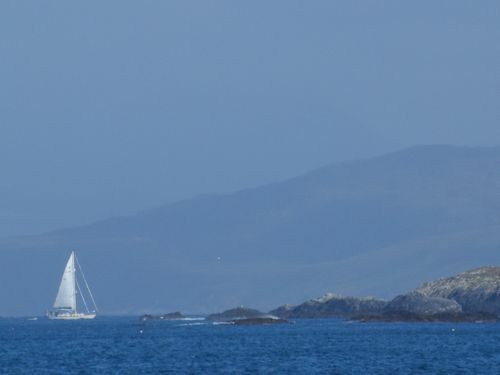 I’d then be able to return, yet again, to the mainland (or ‘Ireland’ as some people call it!) and get on my way to Mayo in the evening. It was when Adrian mentioned Dean from Ballymun that I knew something was a brewing. I had heard Dean speak at a protest march before and knew he was a deep thinking guy, into music, youth work and social change, as well as being one of Damo’s close friends and allies. We had connected on Facebook and were due to meet up but it never happened. The plan to return to the island, just 2 hours after leaving it seemed just about mad enough to be a good idea. If I could interview Damo then happy days, my day would be a success. I caught up on some online work while in Clifden (thanks to the hostel for the free wifi!) as Adrian did a few banking and supply jobs before picking me up for the return drive to Cleggan to get the boat again. On the return trip we talked a lot about the tourism industry, his ideas for the island, his involvement in numerous community projects, and the challenges he has faced as a young ‘blow in’ business owner trying to negotiate with bureaucracy and politics. The more I got to know him the more I liked him and could see clearly that the guy’s a doer, someone who gets stuck in and walks the talk. In fact he is walking more than the talking as he didn’t tell me half of what he is up to when I interviewed him, including the fish processing plant, training courses, food festival,an d wine studying that he is involved with. 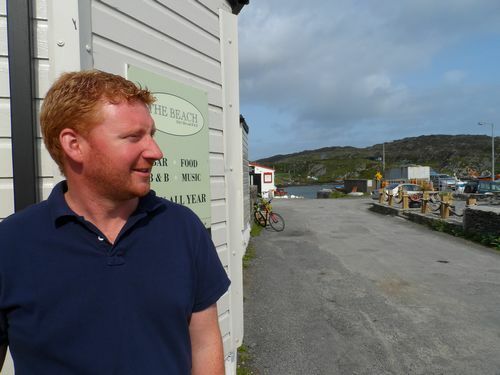 A modest man brimming with enough energy and ideas to ensure Inishbofin has a great future. Arriving at the pier back in Inishbofin I could see Brendan there talking with Roisin and her mother Paula, the same people I’d interviewed yesterday. All knew I had departed just 2 hours earlier on the next stage of my tour and poor Brendan in particular was dumbfounded to see me bounce back like a boomerang as he scratched his head. The look on his face was priceless! ‘What is this fella up to now?’ I could see him think. We all had a good chuckle when I told him what I was at. They suggested I was ‘daft’ to which I responded then I was at the right place, the island colony for daft souls! We’re all a bit daft we agreed in the end. Dean was on the pier too, as it turns out, waiting on the boat out, alongside a big tribe of rapper friends who were hanging out for a few days on the island. I had a chat with him and heard about his dream to bring the concept of peace and reconciliation work for Northern Ireland to the whole island, helping heal the trauma and abuse we have faced as a nation. He dreamt that this was one of the reasons native American Choctaw man Gary Whitedeer had been with them. Being on the island with his friends inspired what he was dreaming up. I interviewed Dean and enjoyed his fresh talking perspectives on the failures of politics and business, and his honesty in saying it’s about finding your own inner perspective to process it all without internalising it, and finding strength in community whilst focusing on the good things in life like swimming. I don’t generally meet people from Ballymun which is part of the fragmentation and division that affects us all but loved hearing about its community focus, and how so many of the 20,000 residents know each other and look out for each other. As Dean headed off he invited me to join them in Ballymun when I’m back in Dublin and to go for a swim in Dollymount, an invite I look forward to accepting. Dean’sea audio ‘spinning in the universe’ interview tells more. Waiting to chat to me was Leo Hallissey, a school principal and community activist with plenty to say on the need to reclaim and recreate spaces, in the same way that Letterfrack, a place associated with so much abuse and horror, is now becoming a hub for innovation, culture and learning, with a furniture design course at it’s core. He was fired up about the dehumanisation of education, taking kids away from real nature experiences and into the virtual world, bringing ipads to classrooms that require the blinds to be shut so kids sit in darkened cells away from the living vibrant world outside us. He said it was like the return of the victorian era, only this time they’ve got technology. Leo struck me as a man with deep knowledge and a passion for change, a fire that isn’t prepared to see his students get lost in system based on numbers and results that are foolishly seen as make or breaks in life. Roisin and Paula had maintained that their offer of a bed in their holiday home still stood, sharing the house with their sister Hannah. At this stage, after a huge day the previous day and going on only 3.5 hours sleep, I was well up that comfort. No more cramped camping for me. So off I went to get settled in just 50 metres up the road in this lovely little island where it’s easy to get around and there’s no hurry in doing so. 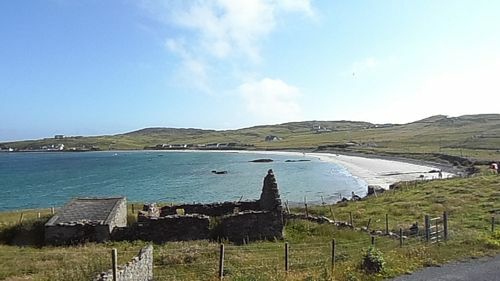 As it turns out their holiday home was next door to and owned by Marie Coyne, who I had interviewed the day before. I was among good people. In the afternoon I popped over to Adrian’s pub for lunch. Upon entering I got chatting to an older Cork couple who are on holidays with their grandchildren, returning tomorrow to host a few Italian language students, something that gives them an extra household income. The husband had realised I was ‘up to something’ and wanted to know more and had plenty to say about the bureaucracy of working in the council. He told me how some of his colleagues got suspended for doing extra work in a remote location without permission, when they filled in some potholes in a rural location near where they were working. I heard how a small business person who moved from West Cork to France because the local council wouldn’t rent him an empty office. The couple felt a major national regeneration programme was needed as there are 100,000s of people unemployed and there is no shortage of national community, maintenance and infrastructure jobs that need doing. Like many people they feel there’s too much incentive not to work. His wife is a cleaner in a bank and remembers hearing the bank staff being told by management to get out there and push the consumer frenzy, and the need for more credit. Now the debt pushers are demanding their repayments from a nation who can just about keep their kids fed. Her husband reckons there’s a bigger plan beyond what we’re being told, that some global forces are behind the world economic situation and that we’re being kept in the dark about that. Looking at the lost leadership around us, and the lack of vision and direction, he might just be right. There is leadership, it’s just not coming from our representatives, but rather from other forces we don’t know about and certainly didn’t elect. More power to Edward Snowden and those who risk their lives to tell us what we aren’t being told and need to know. We’re either a democracy and a republic, or we’re not, and sadly it looks like the latter scenario at the moment. As I was leaving the pub Adrian asked me how I was getting on and if I’d met Damo. No says I. ‘He’s gone now’ said Adrian, explaining I had been standing just feet away from him on the peer while interviewing Dean. Oh well, Damo had escaped, a daring get away by boat. No fear though, the hitching for hope tour will find him. He has too much to say that need to be heard. After lunch the sun came out and the island basked in a blissful light that meant it could beat any Greek island in a beauty contest. Pure magic. I decided to spend the afternoon walking and taking time out from all the listening, or rather to listen to someone else – i.e. myself. I found a magic little beach with nobody on it, a place so great I wanted to tell the nation to abandon whatever they were doing and occupy the amazing beaches of the country so long as we had this rare sun. On the beach I took time to take it all in and try to process some of the dozens of conversations and downloads of recent days. I did some meditation and a hodge podge tai chi effort which helped me relax and feel calmer for the rest of the day. 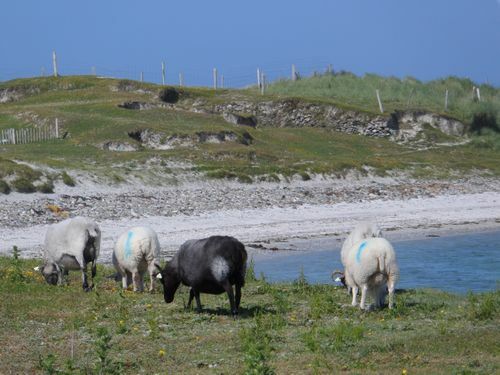 Looking around I saw the beauty of the land and thought about the idea of listening to the land, the sounds of the waves, animals and birds – the other Ireland that gets lost in the traffic. I got a sense of the land being central to what Ireland is and who we are, but feeling the increasing loss in that understanding, as modern culture continues to drive us away from this connection. If the people are disconnected from that land, if they have moved into towns and cities, if they have no time for nature, if schools and workplaces are increasingly computer based, then what chance do we have to connect with the land? As our farmers disappear one by one, do we leave the farming bit to poorer people overseas whilst we connect more to facebook than we do the land. Is facebook shaping us in ways the land did in the past, and is this a good thing? 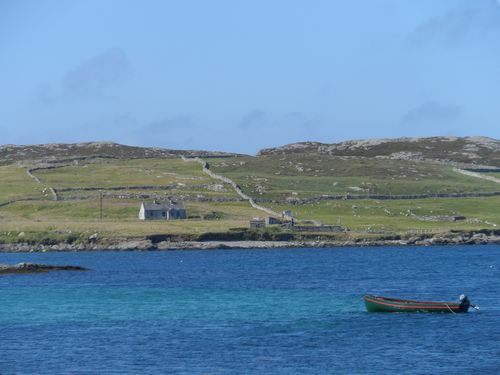 My thoughts drifted to the 1000s of young people in Ireland who will never see this beautiful island, the kids who are brought up in decaying urban environments, abandoned by planners, developers and policy makers who themselves are rewarded with second homes throughout the country. Surely there must be an equality of opportunity, a birth right to nature? The theme for the afternoon became about reflection and connection. 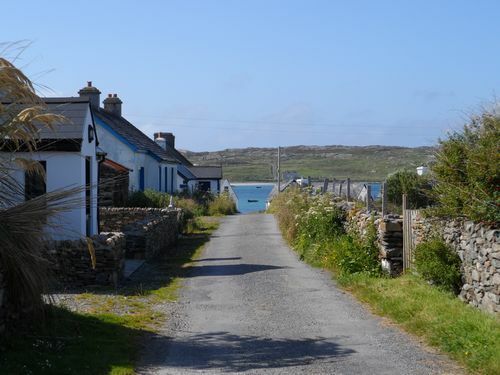 Not that they don’t have their problems on Inishbofin but this place calls people back to a healthier way, a pace of life, connection to land and community, the simple things at a slower pace. The pressures to be productive, to be listening, blogging, tweeting, facebooking, emailing, texting, calling, producing – all needed to fade off this afternoon. I’ve been my own boss for a long time and that gives a certain freedom but it can get tough when that boss is as pushy and results focused as he is sometimes. Sometimes I need permission to step back, to doss a little, or to take time to eat, rest and just be. Like so many people I can drive myself for results, for outputs, for impact. Fair enough to set a challenge but if I’m not stopping to smell the roses and process the learning then I will replicate the madness I seek to heal. The process of this trip is as important as the destination so it was good to step back and take some much needed time to consider some of what has been happening. Sometimes it’s about relearning the art of doing nothing in particular. In the evening I was offered more hospitality and stories as I shared a lovely meal with Paula, Roisin and Hannah. As tempted as I was to head to the pub and enjoy the vibrant traditional music scene on the island, the wiser side got the better of me and I hit the hay, just to be sure I really was going to make it off the island. The rumour mill had started ‘that journalist lad might end up staying here’ but no, as great as that sounded, the show must go on. 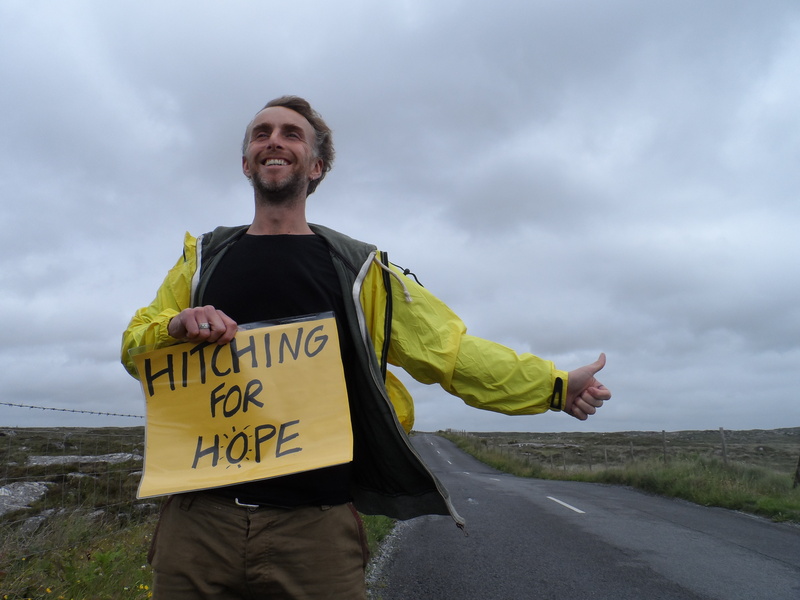 The hitching for hope must continue. Thanks (again!) 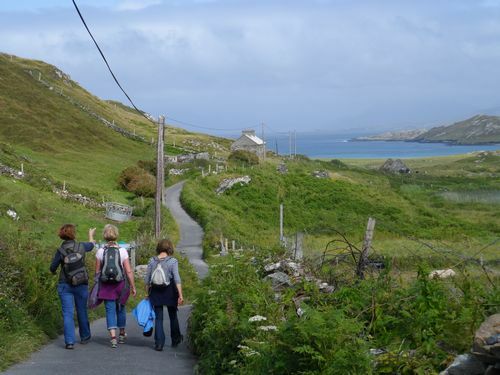 Inishbofin and all the good people I met. P.S. It turns out I had spotted Damien the day before and didn’t even realise it. 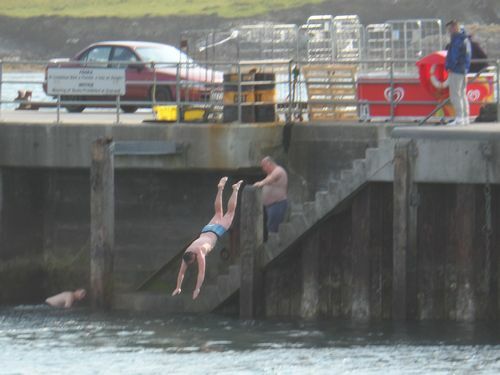 I had taken a photo of a few ‘mad lads’ diving from the pier. Damo was one of them I heard later. Sometimes you are close and you don’t even realise it!